Brrr it’s cold outside! Time to go kick some air into my Zodiac Bombard Commando and while I’m at it mention it to you too. This one is hard to understand for a lot of people because there is so much bad info on the web regarding inflatable boats and proper air pressure. In simplest terms when things get cold they contract, air is a thing. Boyle’s Law comes to mind, Gay-Lussac’s Law, Charles’ Law, and probably a bunch more but the long and short of it means when air heats up it expands and pressure increases, when it’s chilled it contracts and pressure drops. When that boat you kicked air into during the summer months gets cold Mr. Floppy shows up to take it’s place. Mr. Floppy is no one’s friend, he strains the transom attachment points and seams trying to make your outboard hit the deck. Mr. Floppy doesn’t like fun, fuel economy or performance, he wants you to have a bad time. Mr. Floppy loves rodents so if you have a Mr. Floppy in your garage don’t be surprised if rodents become his room mates when you go out there in the Spring. Worrying about your inflatable boat popping in the Sun’s heat is why you are running it soft? Huh? That’s an old trick by Mr. Floppy, remember Mr. Floppy hates fun over all else. 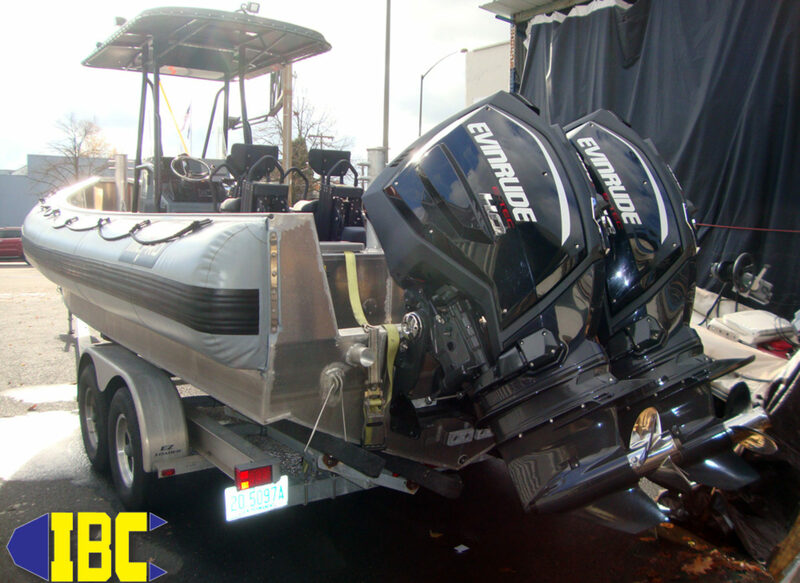 Running your boat soft only benefits the repair shop, it actually shortens an inflatable boat’s lifetime or duty cycle. As a rule you should always have about 3.5 P.S.I. in the main tubes and keel unless otherwise stated by the manufacturer. Airfloors can have 5, 6, 8, even 11 P.S.I. in them to make them perform and give a stable platform. Airfloor types vary by manufacturer so consult your make and model inflation information and keep it tight when it’s inflated. One of the things I’ve always appreciated about inflatable boats is the ability to roll them up and stow them until needed. When you get to a place where you need a stable boat that doesn’t sink you just unroll, inflate and go. All those awesome documentaries I used to watch on T.V. wouldn’t have been possible without inflatable boats so my interest in them began early. When I asked my mom how come they didn’t sink if they got a hole in them, or if Jaws came and took a bite she calmly replied, “Zodiac boats have chambers to prevent all the air from coming out.”. Mom was pretty smart back in the early 70’s and she didn’t have the luxury of consulting the internet to give me those correct answers either. Mom would never have let me get into an underinflated boat, you shouldn’t either. Yes the whole air/temperature thing will generate a lot of calls to the service center this time of year in mainland America. Most of them stem from the user inflating one chamber to pressure, then the next and so on. When Mr. Floppy shows up he makes it look like there’s a leak in one chamber that the user can’t find. What’s occurred is the baffle (the chamber thingy inside) has pushed into the adjacent chamber and taken up part of it’s volume. Things cool off outside and Mr. Floppy presents a chamber that appears to be flat when you go to inspect it. When inflating your boat you should inflate each chamber to shape, then go back and top them off to pressure. This technique ensures that the baffles aren’t pushed into the other chambers and it also helps keep Mr. Floppy from showing up as frequently. If during your winter lay up or inspection process you find a hole that needs patching, fix it, then stow your boat. You’ll really have a bad day when Mr. Floppy shows up the first time you want to use your boat and you can’t because he’s there. Remember Mr. Floppy hates fun! That’s all for now, I have to go kick Mr. Floppy off some RIBs I see him getting aboard. If you have questions we probably have answers, give us a call (503)235-2628 and ask for Mike. To shop our online shop you can go here if you are having problems call and ask for Mike (503)235-2628 it’s probably his fault anyway.